World famous Canadian psychologist and best-selling author Jordan Peterson requested a visiting fellowship at the Faculty of Divinity at Cambridge University. Visiting fellowships are unpaid and allow the fellow to make use of University research facilities and to attend faculty seminars, but not to teach. The fellowship was initially granted on an academic basis. The fellowship was later rescinded after a further review. 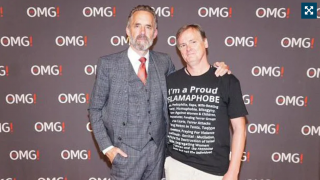 A statement put out by the Vice Chancellor of Cambridge University explained that the Faculty became aware of a photo of Professor Peterson posing with a man wearing a T-shirt with the slogan “I’m a Proud Islamaphobe” [sic]. “I also have a strong belief that people should be allowed to express themselves as they see fit, and I haven’t invoked a dress code at my lectures, feeling that free people who have taken the time and trouble to attend and travel and pay have the right (as they clearly do) to wear whatever they choose,” he wrote in an email. Earlier this month I wrote an article What is Islamophobia? about attempts to define Islamophobia. It appears that Jordan Peterson is now the latest casualty of unfair allegations of Islamophobia. As I argued in that article, Islamophobia is hard to define in a way which does not restrict valid criticism of Islam as a religion. If I think that Muhammad was not a prophet and that Islam is a false religion – does that make me an Islamophobe? Since I wrote that piece, Peter Tatchell has weighed in with a letter to The Times headlined “Free speech is under threat over Islamophobia.” Jewish News columnist, Maajid Nawaz, has also criticised the proposed definition as intended to shield Islam from criticism. Is Jordan Peterson an Islamophobe? I agree with Peterson on this. As I explained in my article on defining Islamophobia, there has been a proliferation of ‘phobias’ arising from competing victimhoods. For exactly this reason I am not a fan of the term ‘Christophobia’ either. Better and more precise terms are ‘anti-Muslim’ and ‘anti-Christian’. Peterson is concerned about ‘Islamophobia’ for the same reason that I am concerned about it – allegations of Islamophobia tend to inhibit free speech. This does not mean that he is anti-Muslim. Nor does it mean that it is fair to allege that he is ‘Islamophobic’ – whatever that may mean. So, let me get this straight. Professor Peterson has his fellowship withdrawn, and the explanation is the importance of free and lawful expression of ideas and viewpoints? Just what has Peterson done that is unlawful here? Where is the respect that Cambridge University should be extending to Professor Peterson with whom we assume they disagree fundamentally? How is withdrawing Peterson’s fellowship aiding the free expression of ideas? Even if we accept the view (which I don’t) that someone’s identity is above criticism, whose identity has Peterson personally attacked? The Vice-Chancellor’s statement is appalling. It has only served to expose the illogical thinking of the university. “I believe that the parties in question don’t give a damn about the perilous decline of Christianity, and I presume in any case that they regard that faith, in their propaganda-addled souls, as the ultimate manifestation of the oppressive Western patriarchy, despite their hypothetical allegiance to their own discipline. “I think that it is no bloody wonder that the faith is declining (and with it, the values of the West, as it fragments) with cowards and mountebanks of the sort who manifested themselves today at the helm. While not formally a Christian, Peterson is ably defending Christianity and Christian principles far better than most Christians are. I reviewed his book, 12 Rules for Life last year, and noted the respect he has for the Bible and Biblical principles. I have since watched his debates with Sam Harris about whether there is a God and what is the source of morality, and found it fascinating to see them both attempt to find an objective source for morality without an objective God. A quest that is doomed to failure. I pray and hope that one day Peterson will accept his own need for God. Meanwhile, faculty members of Cambridge University have made themselves look foolish. If they had any real integrity and respect for free speech, they would rescind the rescindment. I am not holding my breath.